Bumper letter inserts - metal or vinyl? A previous owner of my Mach 1 looks to have had MUSTANG bumper inserts, but dug them out and left scratches. I'd like to just put new inserts in and cover the scratches. The vinyl inserts are much cheaper, so I'd like to hear if those would cover minor gouges, or if I'm better off spending 2-3x as much for the metal? I have some really old vinyl letters on mine that look bad up close. I'm planning on the metal ones like your AM link. I've seen a set on a mustang locally and I think they look good. I would be concerned about the longevity of them sticking to the bumper if I daily'd mine, but she's a garage queen, so I think they'll be fine. I do not think thin vinyl would cover gouges looking up really close, but I wouldn't think you could see them a few feet away (like standing there by the bumper). Re: Bumper letter inserts - metal or vinyl? I'd get the vinyl ones. Metal inserts on a plastic bumper cover seems weird to me. I have vinyl on mine. I think it depends on how deep and wide the gouges are, you could run into a longevity issue either way. 2016 F150 XLT SCrew Cab 3.5 EcoBeast! I like the vinyl. They look more like they're painted on there. Less of an edge like the metal ones have. Ones of the first things I did. Got them from the place everyone on here gets replacement hood stripes. Graphics express? I've always preferred metal. But I like the polished look. These have been on the car since 2004. The pic is from last fall. The car has just over 55k miles and has been washed, waxed, and detailed more times than I care to remember. A top of a few of the letters are starting to get a little loose but not enough to be noticeable to most. I tend to see every single flaw. 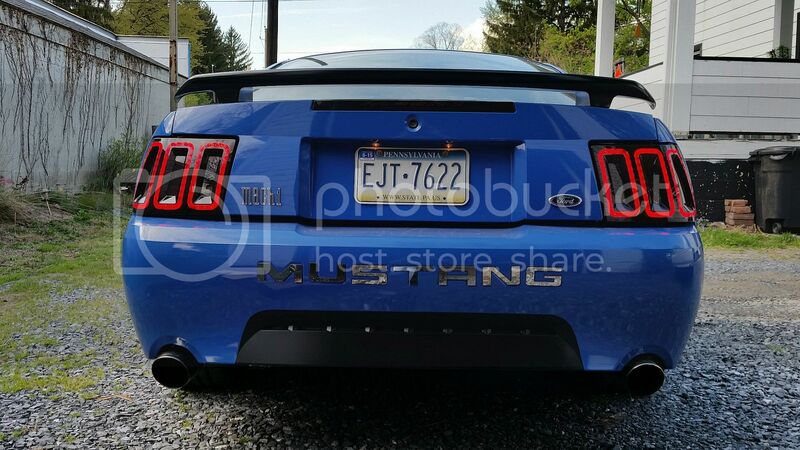 I have finally decided I am going back to the stock tail lights. I have S.S. but would rather have vinyl..